Contemplating a radiant heat solution for your home? Before you decide on a radiant heat solutions provider, make sure you give Warmzone a call for the best selection of products and services at a price that will warm your heart. Warmzone is a top manufacturer and provider of radiant heat solutions.From radiant heated driveways to dog kennels, Warmzone has got you covered. Warmzone has the perfect solution for whatever challenge you send their way. Having one of the most extensive product lines in the industry not only allows them to deliver the right solution for your specific radiant heat project. They’ll do it at a price you can live with. And, Warmzone takes pride in its professional engineering and design services, available at no addition cost to their customers. Warmzone offers the most comprehensive information resource on the Web. Visit www.warmzone.com and you’ll find an impressive collection of free resources to choose from, whether you’re a current customer or not. Warmzone professionals are continuously updating an extensive library of online information devoted specifically to radiant heat. Let’s say you’re ready to take a deeper dive in researching a radiant heated driveway. Check into the library and chances are you’ll forgo a lot of research with one simple click on an article link. If you’re an avid do-it-yourselfer, there are plenty of helpful free resources available on line, 24/7, including installation manuals, cross section diagrams, specs and more to help you with your radiant heat project, from heated floors to snow melting and roof deicing. Warmzone staff are not just professionals, they’re deep generalists. Warmzone has forged a number of relationships with manufacturers, suppliers and contractors well-versed in radiant heat. These partnerships often span years. The value, of course, is that Warmzone radiant heat professionals are on the pulse of the latest technologies, installation techniques and products. So you can expect the best radiant heat products and prices possible for each custom project you take on. In fact, Warmzone is constantly searching and testing the latest radiant heat products to give customers the highest quality radiant heat solutions around. When you call Warmzone, you can’t help but notice the enthusiasm you’ll hear at the other end of the line. If you have a radiant heat solution in mind, it pays to call Warmzone. They’ll happily address your concerns, whether they make a sale or not. Because they believe customer service begins before any sales transaction is ever completed. Just call 888.488.9276 and find out for yourself. During the winter months, ice and snow build up can have a devastating effect on roofs, causing gutters to sag and shingles to break free. Electric radiant snow melting systems can eliminate this damage without emptying your wallet. A well-fitted, properly installed roof deicing system can keep roof valleys and eaves free of ice dams and buildup. 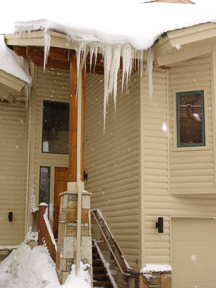 Eliminating ice dams greatly reduces the chances of roof damage and unwanted seepage. Water damage from a roof ice dam is often not discovered until a great deal of damage has been done. The necessary repairs can be very costly. Ceilings, walls and even floors can be damaged, and mold growth is also joins in the fray. A Warmzone roof deicing system is the optimal solution for melting snow and ice from roof eaves, valleys, even entire roofs. Roof deicing systems are customizable for just about any roof type and configuration. And Warmzone is the recognized industry leader for providing one of the largest selections of state-of-the-art radiant snow melting systems, including electric and hydronic options. Unlike other “one-solution-fits-all” providers, Warmzone has the products to design a solution that not only meets your snow melting needs, but fits your budget as well. Determining the ideal heat cable, thermostat and sensor for your roof heating job depends in part on the size, type and construction of the roof, and also on the overall requirements of a particular installation. Warmzone is always available, with the experts and expertise necessary to assess your system and determine what you’ll need to optimize overall performance for your home. And keep this in mind: at Warmzone, the relationship doesn’t end with a purchase. Their experienced staff will work closely with you to ensure your radiant heat system is installed properly and performing as expected. For more information on a roof deicing solutions, call 888.488.9276.